Warren Spragg has challenged his Fylde RFC players to play the game they want to at Tynedale tomorrow, and that means getting their discipline right. Fylde continued to incur the wrath of referees to their cost last weekend, losing at home for the home first time this season as Sheffield Tigers took advantage of a lop-sided 19-10 penalty count and the sinbinning of Matt Garrod to edge a 25-24 victory. Despite scoring four tries to one and leading by five points with just two minutes remaining, Fylde conceded two crucial late penalties and the faultless boot of Mark Ireland ruined their day. Spragg said: “We went into the game knowing Sheffield would be the strongest side we had faced so far. They were battle-hardened after playing four aspiring top-six sides. Spragg refused to use any inconsistency in referees’ interpretations as an excuse. He added: “You have to take the referee out of the game. If you allow yourself to become fixated on the referee, you lose focus on your own game. “It comes down to decision-making and whether risks are worth taking. If you go into the tackle to make a turnover when you are eight points up, you have to ask yourself if this is a risk you need to take. That applies to attack as well as defence, though it’s easy with hindsight to criticise players for turning down straightforward penalty goals and running the ball instead. And Spragg certainly doesn’t want to coach such attacking instincts out of players. He explained: “The game is about the players. They make decisions and are accountable. I have to get the best shared understanding among the players that I can, so they can predict what each other will do as a team in the course of a game. “Adam Lanigan took a quick tap when we had a penalty in front of the posts. I’m not going to say to him that you can’t make that decision. “Players have to understand their decisions have consequences but I want my team to play with no fear. It was only Lanigan’s second game as the scrum-half continues to deputise for the injured Cam Crampton. Spragg added: “Adam is growing into the role well. He has been a great surprise to us and is doing the basics right. Fylde will also be without the experience of captain Adam Lewis for a few more weeks as the prop gets over a knee injury. 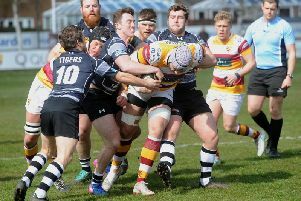 After facing opponents new to them in recent weeks, Fylde head to a familiar hunting ground tomorrow to face Tynedale, though Spragg admits he is uncertain what to expect of north-east hosts who are still awaiting a win. He said: “Tynedale are strong at home, and after relegation they were throwing the ball around last season.